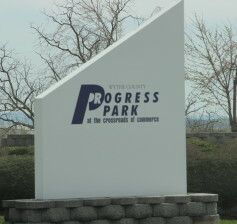 WYTHEVILLE, Va. – Over the past two decades, Wythe County has invested over $40 million in the development of Progress Park; an investment that has netted a return of 750 jobs and millions of dollars in additional tax revenue. In an effort to remain proactive in the ever changing business climate, Wythe leaders say they will begin marketing the county’s premier industrial site in-house. The idea was first proposed earlier this year, prior to the retirement of longtime Joint Industrial Development Authority (JIDA) director, Dr. Alan Hawthorne. WYTHEVILLE, Va. – A capacity class of twenty-eight individuals – all wishing to become emergency responders – participated in a state sanctioned emergency vehicle operator’s course [EVOC] this past weekend at Wytheville Community College. Completion of the two day training program is a requirement for any person interested in becoming a first responder, including law enforcement officers, fire and rescue personnel, as well as those seeking a career in emergency management. Participants sat through eight hours of classroom presentation on Saturday, as Ikey Davidson, Wythe County Emergency Services Coordinator, lectured the class on the subject of state laws pertaining to emergency vehicles and provided students with safe driving instructions. The event, which is part of a cooperative effort between the Wythe County Department of Parks & Recreation and the Virginia Department of Game & Inland Fisheries (DGIF), began at 9 a.m. and provided many children with their first opportunity to fish. With DGIF trucks having stocked the lake’s trout pond the previous evening, the county’s youngest anglers were provided the first opportunity of the season to reel in one of Virginia’s famous Rainbow Trout. The Wythe County Department of Emergency Management is urging residents to take precautions, as a slow moving storm front moves through the region today and into tonight, bringing scattered to numerous showers and thunderstorms. The primary threat will be localized flooding, beginning on Thursday. A Flash Flood Watch is in effect for Wythe County through late tonight. Residents should expect an average of 1.5 to 3 inches of rain, with even greater amounts in some areas. Flash flooding of small creeks, streams and urban areas will be possible. Flooding of larger river basins may occur tonight and into Friday. 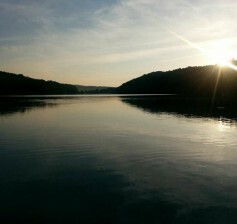 Rural Retreat, Va. – Wythe County’s Rural Retreat Lake Campground Park will be hosting “Kids Fish Day,” this Saturday, May 17th. The annual event is made possible by the Virginia Department of Game & Inland Fisheries (DGIF), in an effort to provide unique fishing opportunities for young anglers and park visitors. Registration for the free event is set to begin at 8:30 a.m. at the lake’s trout pond, with youth fishing lasting from 9 a.m. and until 1 p.m. During this time, only children 15 and under will be permitted to participate in fishing at the lake’s trout pond; located on the south side of Lake Rd. Adult supervision will be required for all participants and snacks will be provided to the children. 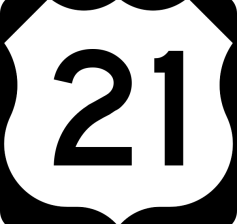 WYTHEVILLE, Va. – This week, Wytheville and Wythe County announced the first annual “Road Market Sale” along Historic US Route 21. The event, scheduled for July 25, 26 and 27 is the product of the multistate initiative known as “Take a Break from the Interstate.” This 70 mile long yard sale will span from Wytheville to Jonesville, North Carolina. “The road market event has the potential to bring an incredible number of additional travelers to the community,” said Wythe County Tourism Director Jeremy Farley. 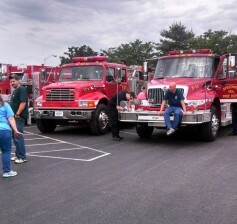 WYTHEVILLE, Va. – Virginia Governor Terry McAuliffe has designated the entire month of May as “Electrical Safety Month.” The designation comes on the heels of an estimated 25,900 residential electrical fires across the nation, last year. Electrical fires are responsible for over 275 nationwide deaths annually and lead to more than $1.1 billion in total property loss. In an effort to combat this alarming trend, Chip Dunford, Wythe County building official, has released a series of tips for local residents to follow in order to adhere to electrical safe practices. Among the tips Dunford listed are encouraging residents to talk to their children about the dangers of playing around power lines and poles. 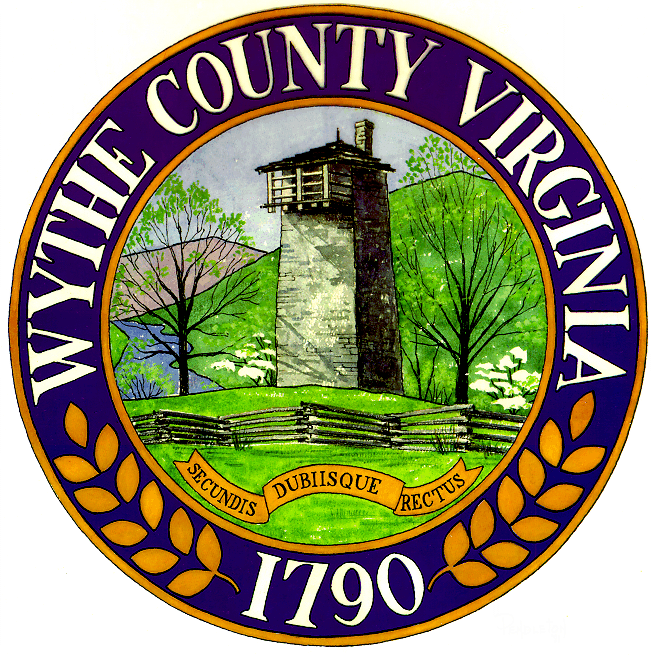 WYTHEVILLE, Va. – The Wythe County Department of Emergency Management was notified today that a recent grant application to the Wythe-Bland Foundation netted nearly $200,000 in grant funding for the county’s emergency services. 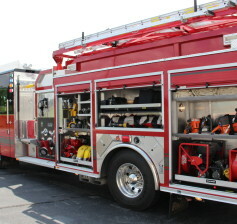 The county’s department of public information & grants submitted the application earlier this year, requesting funding on behalf of the nine non-profit fire and rescue organizations operating within the county. “The funding provided in this grant will enable the purchase of several items our county’s first responders have badly needed,” stated Wythe County Emergency Manager, Ikey Davidson. Abingdon, VA – Adam McPeak & Mountain Thunder, Leigh Beamer, and Valley Grass will perform at the 3rd Annual Crooked Road Youth Music Festival. David Chrisley will also perform with Close Kin – Our Roots Run Deep. The festival takes place on Saturday, May 10th from 11 AM–7 PM at Heartwood in Abingdon. 25 bands from throughout Southwest Virginia will be performing on two stages throughout the day, and an “Old Time Square Dance” will take place inside Heartwood from 5-7 PM. 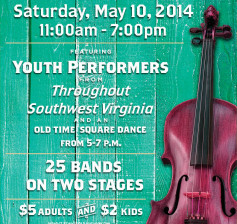 The square dance will feature Shawn Brenneman, caller, and The Lee Highway String Band. All are welcome to participate!